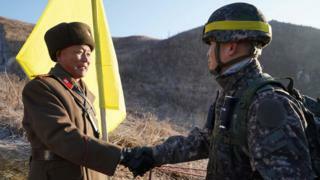 North and South Korean soldiers have made several friendly crossings into each other’s territory for the first time since the countries were divided. The men were checking the dismantling of guard posts in the Demilitarised Zone (DMZ) along the border as part of the two sides’ recent rapprochement. Footage showed the soldiers shaking hands at the border before crossing. The Korean War in the 1950s left the peninsula divided and no formal peace treaty has ever been signed. As part of the talks between the divided peninsula, the South’s President Moon Jae-in and the North’s Kim Jong-un agreed to remove some of the guard posts on the heavily fortified border. The two leaders held a historic meeting in April, which led to talk between North Korea and the US. Since November, both North and South have blown up or dismantled 10 of their border posts. On Wednesday, South Korean inspectors visited each of the guard posts on the North’s side while North Korean inspectors later inspected the same process in the South. “This marks the first time since the division that the soldiers of the North and South… are peacefully crossing the military demarcation line,” the South Korean defence ministry said in a statement. Both sides still have more guard posts in the DMZ, both over and underground. This would have been unthinkable 12 months ago. Last November, shots rung out across the DMZ after a North Korean soldier made a dash across the border. Now the two sides are shaking hands, exchanging cigarettes and walking into each other’s territory peacefully for the first time. Seoul hopes that these small steps will be irreversible and it will become difficult for either side to backtrack on what they believe is a path towards peace. But the insurmountable obstacle remains – the North’s nuclear weapons. The US maintains it will never allow an agreement to formally end the Korean war, nor will it lift economic sanctions imposed upon the North while the Kim regime poses a nuclear threat. So yes, applaud these images and the progress that they represent, but it’s worth keeping in mind just how very far this potential peace process has to go. Last month a train travelled from South Korea across the border into North Korea for the first time in decades, as part of a commitment by the South to help the North modernise its rail network. There has been speculation Mr Kim could visit Seoul this year but the South’s government earlier this week said that no such trip was expected before 2019. Despite its misleading name, the DMZ is one of the world’s most heavily fortified places. The area is a strip of land 250km (155 miles) long and 4km (2.5 miles) wide that runs across the peninsula. It is heavily mined and fortified with barbed wire, rows of surveillance cameras and electric fencing – and is guarded by tens of thousands of troops on both sides.